Heavy heart? For the first time, I panicked. In the days leading up to the hurricane, the weather was beautiful. But signs of trouble were everywhere. UPS recalled all its drivers, stopping deliveries at a crucial time. A text chain went around telling residents to download an app called Zello, which turns your cell phone into walkie-talkie. 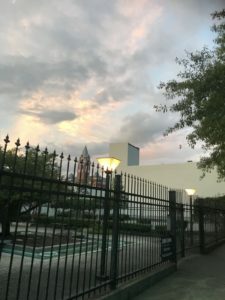 A friend called to say Anderson Cooper had been spotted downtown — the surest sign yet that darkness was descending. A story went around that Florence was carrying flying sharks. By 11 p.m. on Thursday, the sound outside my bedroom window was like what you hear sitting on the wing of a plane during take-off. It lasted into Friday, when, at daybreak, as if by some freaky fiat, the power went out. I bought a pair of rabbit ears at Best Buy and a Yamaha EF2000iS generator at Costco. That kept us tuned into local news, where we learned that a young mother, Lesha Murphy-Johnson, was killed with her eight-month-old son when a tree fell on their home. The rain totals kept rising: Ten inches, fifteen. 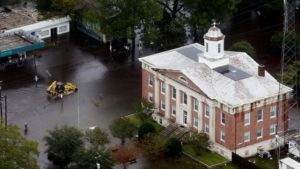 In a city of 120,000 people, four hundred people were clamoring for rescue. Then came the drenching rains and a new worry: Tornadoes. 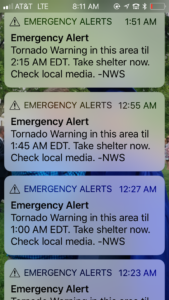 As poorly as we slept Thursday night, we slept worse overnight Friday, our phones buzzing with emergency weather alerts. 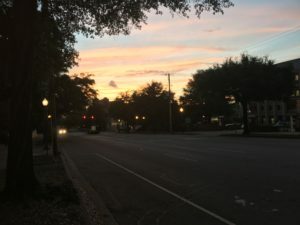 At 1 a.m., the ABC affiliate, WWAY, had to go off the air because a twister was heading toward its station. Reporters dropped to their knees facing walls and prayed. Saturday was, literally, a washout. On Sunday morning, with a break in the rain, we finally ventured outside. That was when my phone buzzed with the water warning. After trying to find a way out when there was none, I got a second alert: An emergency supply of diesel fuel was being delivered from a shipping company called Colonial Terminals. (You guys are now on my Christmas card list!) Crisis averted. Except for the toxins that were escaping into the water tables from industries whose pumps and filters failed. Right now, Duke Energy is valiantly trying to restore power to an estimated 300,000 people. As I write, transformers are exploding around the block from sudden surges. 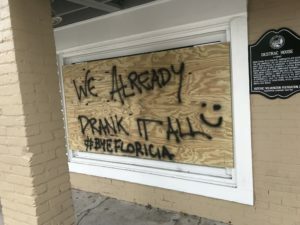 There have been isolated incidents of looting, including at a Family Dollar Store ten blocks away, where five were arrested. The police have promised a swift response. But everyone is on edge. A half-dozen cops descended on one of my African American neighbors yesterday when they saw him borrowing a ladder to check on his roof, assuming he was looting. He’s lived there for decades. There are also miraculous sights, like military helicopters descending from the sky to deliver food to a Harris Teeter supermarket. I-95 is still closed, but portions of I-40 have re-opened, and you can shop at our local Whole Foods without lines. The back-ups that wound two blocks around gas stations are thinning. Meanwhile, random acts of kindness are everywhere. At the Gourmet Market, a block from the river, Donna worked in the dark this weekend to make cold meals for needy customers. At the Husk, you could get an all-you-can eat five-dollar barbecue and the Panthers game on Sunday. The airport just re-opened to commercial traffic, although arriving passengers are finding it hard to get rides into town. And neighbors are checking on neighbors. Yesterday, I sat on the porch of mine, a retired school teacher who’s lived here since 1967, eating a crawfish stew and drinking bourbon while he narrated the unexpectedly rich and complex history of the oak trees that went down on his block. 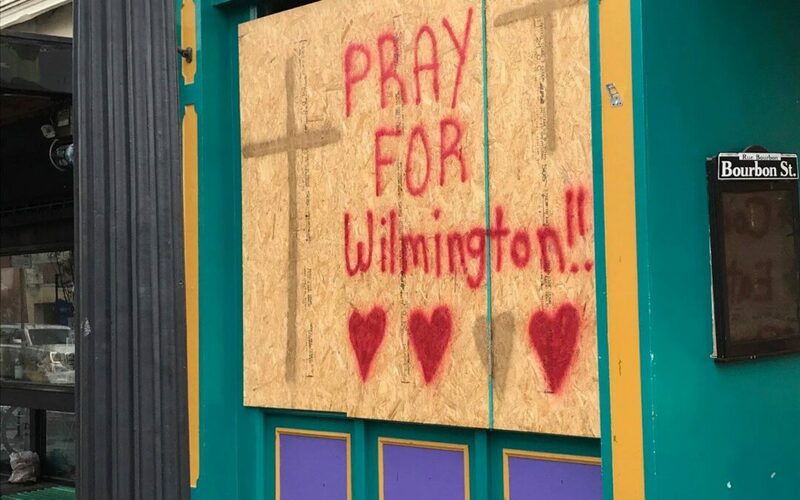 Wilmington is a party town, and there’s going to be a party once the glass shards get cleaned up around the stores on Front Street, the plywood boards come off homes, and the shelters get emptied. But right now we’re under a 8 p.m. curfew. A friend tried joking, “Fun! You get to experience societal breakdown first hand.” But it didn’t quite work as a joke. Judging by Whole Foods, we’re still a few kale deliveries away from a societal breakdown. The main roads are also passable, even with traffic signals effected by the outages. This afternoon, I pulled up to one of those downed lights and everyone stopped to look into each other before coming to an invisible, mutual decision about who went first. It was a way of sharing the load. It also made me feel confident about how we’ll get through this. Writers write to make sense of things for themselves and the rest of us. Thanks for sharing your frenetically anxious first-hand account. I hope to get back to the coast (just north of ILM) by the end of the weekend. I cannot transport diesel fuel on I-40, so I’ll trust that Colonial Terminals and others will stabilize the situation.